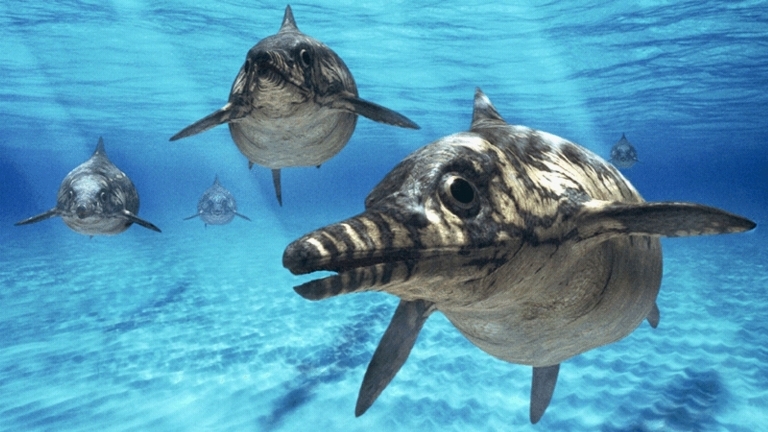 As you know from our recent studies of pliosaurs and plesiosaurs, they were creatures that lived in the sea and oceans and were most definitely created by God. Also, because the words “pliosaurs” and “plesiosaurs” were not made when the Bible was written or translated. Actually, the two words for these sea creatures was not made until over 200 years! So, it is not that the Bible didn’t mention them by name (the words weren’t created yet), but it does talk about creatures that fit the description! First of all, to describe the word “dragon” in the above passages we need to look at the context and the Hebrew wording. The context says that this “dragon” lives in the water, specifically seas. The Hebrew word for “dragon” is tanniyn and sometimes the surrounding context clearly suggests that it is a snake (as translated) or some other kind of “monster”. This word, tanniyn, actually means “a marine or land monster, i.e. sea-serpent or jackal:–dragon, sea-monster, serpent, whale.” Because of the strangeness associated with this word it is often translated as a serpent. But, as far as I have seen, this translation of serpent matches up with the context. The other translation would be “sea monster” or “sea dragons”. These monsters are mentioned in the first chapter of the Bible. And God created great whales (tanniyn), and every living creature that moveth, which the waters brought forth abundantly, after their kind, and every winged fowl after his kind: and God saw that it was good. Some translations actually have the word “whales” for “monsters”! Anyway, the other references in the Bible do not just refer to your everyday shark, whale or dolphin. No, these creatures are surely the same ones that lived with Job; Leviathan-like creatures in other words.